Will Sparks – At 23 years young, Will Sparks has cemented his position at the forefront of the globally loved Melbourne sound. Countless original productions have spent weeks inside the Beatport top 10 in addition to signature remixes of global hits such as Major Lazer’s ‘Be Together’, Robin Thicke’s ‘Blurred Lines’ and The Chainsmokers’ ‘Selfie’. In his home country he was voted ‘Breakthrough Artist Of The Year’ only to be named the #1 DJ in Australia just 12 months later – fast forward a few years and Will has been listed as #78 in the DJ MAG ‘Global Top 100 DJs’. 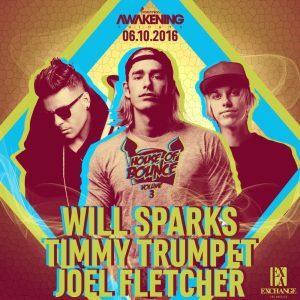 Now expanding his horizons, Will Sparks is spreading like wildfire with recent festival appearances on some of the biggest stages in the world including Tomorrowland, Stereosonic, TomorrowWorld and EDC as well as touring from continent to continent, 11 months of the year and hitting the 650k Facebook fans milestone. Since his genre-defining track, ‘Ah Yeah!’ hit #3 on the Beatport overall charts at the tail end of 2012, Will Sparks has become unstoppable, hit after hit. Producing original tracks like ‘Catch’, ‘When The Lights Go Out’ and ‘This Is What The Bounce Is’ he garnered the attention of global heavyweight dance label Ultra Records. In the past 3 years alone, he has seen more achievements than most artists see in an entire lifetime.